As you see, the genre is not brand new. 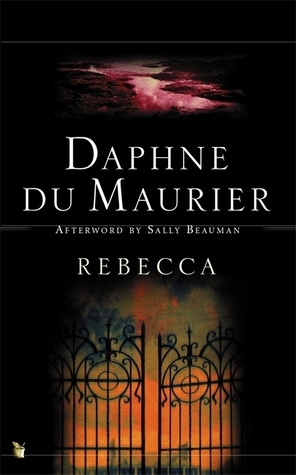 Rebecca is for me a great example of gothic novels written in the first half of the 2oth century. I kept bumping into this novel on many book blogs, and discovered that Book Journey was organizing a read-a-long so I knew time had finally come for me to read it. I dived into it without reading any presentation, and had no idea what kind of water to expect. Wow, what a swim it was! I actually wanted to read over and over again the first chapter, hauntingly beautiful. I even wanted to paint it – it may actually happen one day! I loved the descriptions of the landscapes, of the house, the sea, the people and their characters, the ambiance, definitely gothic! I felt magnetized by the book and the depth of its characters.At the beginning, the heroin seems rather shallow, too immature and almost two dimensional, but little by little, her character grows and makes for a loving and courageous person. And the plot was not what I expected. When I finished the book, I re-read right away the first chapters, looking for the clues I had missed. It was an interesting experience. If you have not read yet this classic, you have to give it a try. See below the fascinating questions proposed by Sheila @ Book Journey, and my answers. Of course, that part is full of spoilers, so don’t read it if you plan to read Rebecca one day, as you have to approach it without knowing anything, that’s the best way. 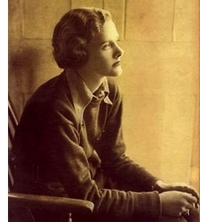 In many ways the life of Daphne du Maurier resembles that of a fairy tale. Born into a family with a rich artistic and historical background, the daughter of a famous actor-manager, she was indulged as a child and grew up enjoying enormous freedom from financial and parental restraint. She spent her youth sailing boats, travelling on the Continent with friends, and writing stories. A prestigious publishing house accepted her first novel when she was in her early twenties, and its publication brought her not only fame but the attentions of a handsome soldier, Major (later Lieutenant-General Sir) Frederick Browning, who married her. with links, 18 questions! , comments, etc! 1. Du Maurier admitted that her heroine has no name because she could never think of an appropriate one—which in itself is a telling comment. What effect does it have on the novel that the new Mrs. De Winters has no first name? Funny enough, it took me a while to realize she did not have a name; at one point, I read back to see if I had missed it, when I realized she was not Rebecca!! Not giving her a name contributes to highlighting her lack of assertion: if you read the book without any introduction, you may assume that she’s called Rebecca, and you discover she has no name, no personality – at least at the beginning. It interestingly puts the focus on a dead person, and makes the whole story revolve around Rebecca, as a haunting presence. 2. What kind of character is our heroine—as she presents herself at the beginning of her flashback? Describe her and her companion, Mrs. Hopper. Too shy, and passive, too used to live in the shadow of a demanding boss, or later of a haunting presence. She sounds more like a very young kid than a young lady, with actually no real character, no will or mind of her own. Mrs. Hopper uses the situation by having her do whatever she wants at any time. She knows she will be obeyed unconditionally. I had a hard time with pinpointing who this man was. Even in his first moments with his future 2nd wife, he seemed very aloof, distant. He looked more like a father figure than a possible lover. He seemed to me like a man trapped in his own social milieu. And actually, maybe he shared the young lady shyness, in the sense that he was not able to assert who he was and break from his social milieu, in which I am not sure he was that comfortable. But maybe I am projecting too much!! I guess only very late in the book do we realize why he fell in love: I think he really enjoyed the freshness, simplicity of this lady. 4. The heroine describes Maxim thus: “His face…was arresting, sensitive, medieval in some strange inexplicable way…rob him of his English tweeds, and put him in black, with lace at his throat and wrists, he would stare down at us in our new world from a long distant past—a past where men walked cloaked at night, and stood in the shadow of old doorways, a past of narrow stairways and dim dungeons, a past of whispers in the dark, of shimmering rapier blades, of silent, exquisite courtesy.” Why is this an apt description? In other words, how does it set the tone and foretell the events of the novel? This is such a neat description, setting the Gothic tone of the novel, with ideas of oldness [medieval], mystery [strange, inexplicable,narrow stairways, silent], gloom [black, night, shadow, dim dungeons, dark], memory/present reality [he would stare down at us in our new world from a long distant past]; he also shows the social milieu, with the tweeds and lace. This black and white reality is all there will be of the burnt Manderley. And the word THROAT might even hint at the big upcoming revelation! 5. In what way does the relationship between the young heroine and Maxim change during the months after their arrival to Manderley? Is there still a relationships then between them? She seems to be more part of the decor! 6. What role does Mrs. Danvers play in this story—in her relationships to the characters (dead and alive) and also in relation to the suspense within the novel? She is very instrumental in having the reader stay focused on Rebecca, and on creating the Gothic ambiance, with maintaining gloomy mysterious rooms that are hardly ever opened, for instance. She is also scary when talking with Rebecca, and totally mean (see the scene of the costume ball. She appears like the living double character of Rebecca. And finally she is the key element in the final fate of Manderley. 7. What is the heroine led to believe about Rebecca? In what way does the dead woman exert power over Manderley? At this point, what are your feelings about the new Ms. de Winter? Are you sympathetic toward her plight…or impatient with her lack of assertion? Or are you confused and frightened along with her? The heroine is led to see Rebecca has a person with a special aura, from a very fancy milieu, with high tastes, and extremely beautiful, so like her total opposite in life. I had sympathy for her, but at the same time wanted to kick her to change Manderley with things that SHE liked, to make it HER own world, not the world of another person, dead at that! 8. What is the heroine’s relationship with Maxim’s sister Beatrice and her husband Giles? What about the advice Beatrice offers the heroine? ? 9. Both Beatrice and Frank Crawley talk to the heroine about Rebecca. Beatrice tells the heroine, “you are so very different from Rebecca.” Frank Crawley says that “kindliness, and sincerity, and…modesty…are worth far more to a man, to a husband, than all the wit and beauty in the world.” What are both characters trying to convey to the heroine…and how does she interpret their words? 10. What are some of the other clues about Rebecca’s true nature that the author carefully plants along the way? 11. How might the costume ball—and the heroine’s appearance in Rebecca’s gown—stand as a symbol for young Mrs. de Winter’s situation at Manderley? She has not found ways to be herself, she is not even able to choose a facade [costume], she cannot even invent her own ways of enjoying a party – she does as she is told to do, once again – just like with her former boss. And she is so naive that she did not figure out that Mrs. Danvers’s idea could absolutely NOT be a good thing for her to follow. 12. Were you surprised by the twist the plot takes when Rebecca’s body is found…and when Maxim finally tells the truth about his and Rebecca’s marriage? Did the strange details of plot fall into place for you? I have to admit I was not expecting that at all. It then explained better his aloofness and problems with his dark memories of the past. Before, I thought this was only due to his regret of having lost his wife through suicide. 13. How, if at all, do Maxim’s revelations change your attitude toward him? Did you feel relief upon first reading his confessions? Can you sympathize with his predicament, or do you censure his actions? What do you think of the heroine’s reaction? In her place, how might you have reacted? He suddenly became so much more human. I would have expected to tell his 2nd wife the truth much earlier on. 14. How does this new knowledge alter the heroine’s behavior and her sense of herself? From then on, her reaction is more and more loving and supporting. She sounds less passive to me, finally free to be more herself. 15. After Favell threatens to blackmail him, Maxim calls on Colonel Julyan. Why? Why does Maxim act in a way that seems opposed to his own best interests? I guess he is so torn by his feeling of guilt that he does actually wants justice to be done. But then, roles seem to be reversed: his new wife becomes more active in trying to protect him, and he is very passive, following along. 16. In the end, what really happened to Rebecca? What is the full story of her death? Is it right that Maxim is absolved of any crime? Was he caught in an untenable position? Was Rebecca simply too evil—did she end up getting what she deserved? 17. How do you view the destruction of Manderley? Is it horrific…or freeing…or justified vengeance on Rebecca’s part? Would the De Winters have had a fulfilling life at Manderley had it not burned? I see it as an opportunity of freedom, a chance to restart all over again for the new couple, but the fact they live in a hotel does not seem to show that they fully seized that opportunity. And also, the book opens with her dream, so she still seems to be haunted by it, not yet free! Last night, I finally watched the movie! Actually, I found some passages in the book, with Mrs Danvers especially, much more creepy than in the movie! After the movie, I watched some extras with interviews. There was something comparing Du Maurier’s and Hitchcock’s Gothic worlds, very interesting. One passage intrigued me though: they talked about Du Maurier’s sexual life [bisexual], and talked about the relationship between Rebecca and Mrs Danvers as lesbian. Did you perceive that in the book? Did I miss it all? Let me know what you think. IF SO, WHAT DID YOU LIKE MOST ABOUT IT? WHAT DO YOU THINK ABOUT THE MOVIE VS. THE BOOK? ESPECIALLY WHERE I DID NOT ANSWER! DO YOU FEEL LIKE READING THIS BOOK?